Former Cleveland High School All-American basketball player Vincent Yarbrough encourages Cameron Liner and Evan Liner, right, as they participate in a wheelbarrow race during a basketball camp at the high school Tuesday. Yarbrough has been playing basketball in Europe for several years, and it was his first time back to his alma mater since a ceremony to retire his jersey. As far as physical features go, not much has changed as far as Vincent Yarbrough. He still stands 6-foot-7 and still sports a frame of about 215 to 220 pounds, much as was the case in his standout playing days. Where the complete 180-degree turn has taken place has been what's happened on the inside. It's there that one can see the growth and maturity that comes after years of being in the spotlight, which after shining so brightly for so long only flickers occasionally. Yarbrough spent his adolescent years being thrust in front of others, and at times suffered because of it. Now at 31 years old, he's at peace with it. The accolades are still the same. Once ranked the top player in the nation as a junior at Cleveland High School, Yarbrough spent the summer months prior to his senior season in 1997 being recruited by all of the top colleges in the nation, with a final four list including Kentucky, Duke, North Carolina and Tennessee. To some people's surprise, he chose the Vols after at one time committing to Kentucky, but he went on to have a career that included UT top-10 rankings (to this day) in scoring, rebounding, blocks and steals. He still is the Vols career leader in steals. He was the youngest player to play in an NCAA tournament game in 1999, having not yet turned 18 years old when the Vols lost to Southwest Missouri State in the first round. He was drafted by the Denver Nuggets in the second round of the 2002 NBA Draft, going on to start 39 games as a rookie with averages of 6.9 points, 2.7 rebounds and 2.2 assists. He was cut after his rookie season, however, which was a new experience for him. "It was really hard to understand that situation," he said Wednesday. "The thing I always thought about the NBA was that it was about numbers. In my situation, wins and losses didn't matter because we were the worst team in the league, so I thought my numbers as a rookie would stand ground, so it was the hardest thing I've ever had to get over. "I looked and had better numbers than some others but they were kept, and I could never get it in my head why it happened. At that time, I felt my numbers spoke for themselves, so why wouldn't somebody take a chance? I always thought someone would call; it wasn't about the money because Denver was still paying me. They were working on a sign-and-trade, but no one wanted to. "My head was just in a strange place." Yarbrough remembered telling a reporter once he was cut, "this isn't the last you've heard from me." He went on to spend a year in Italy, then off to Belgium, then another year in Italy before spending his final four seasons in Germany. In his first stint in Italy, management didn't pay the players and the team folded. At one point, he had lost the desire to continue playing until getting a call from his coach in Italy with the opportunity to play in Belgium. He had two opportunities to return to the NBA, spending time on summer leagues with San Antonio and Minnesota, but the Spurs, needing a point guard, went a different direction, then Yarbrough injured his foot during practice before the Timberwolves' summer league started. "I could have continued in summer leagues, but that mainly depends on where you are in life," he said. "You can continue to play in summer leagues, but you could miss four checks in Europe. I didn't want to spent all that time practicing with a team for them to tell me in November that they were going to cut me. Once I had a family, I couldn't commit to a team for three months for zero dollars." Married at that point, Yarbrough chose to stay in Europe as opposed to continue to chase NBA opportunities. "I was really happy in Europe," he said. "I think if I had stayed in the states, I would be a different person. When you're in the NBA, you start to live a different type of life and things that had been real aren't so real anymore, so I was really happy. I wasn't happy I was put out of the NBA, but I was happy for the experience to grow and become a man and not something else. My family was there, and I was able to become a good father and share the bond with my wife." The victim of some nagging foot injuries, Yarbrough chose to retire from his overseas stint in June of 2011. 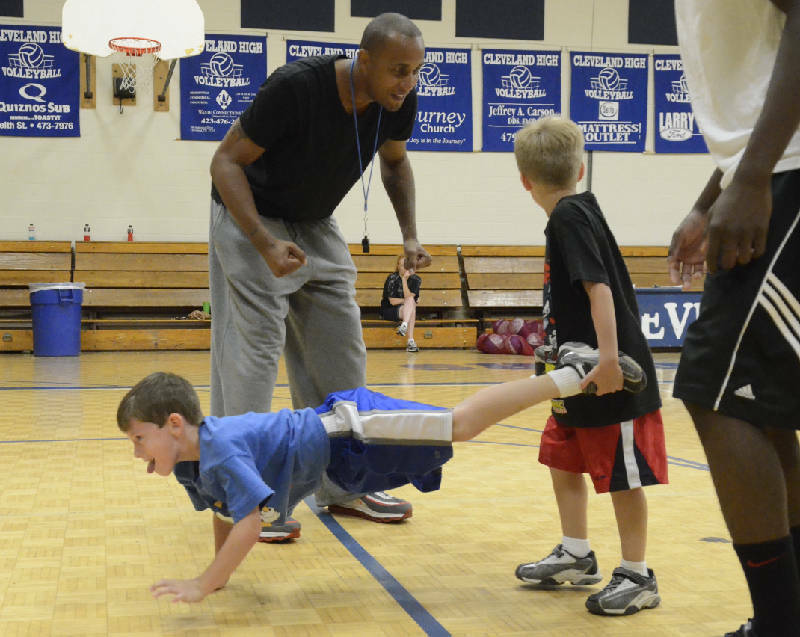 He now spends his days with a wife and two kids living in Culleoka, Tenn., also working with the Yarbrough Basketball Specific Training, which mentors and trains kids in the Nashville area. He also coaches the 17-under Tennessee Travelers, and attends Middle Tennessee State University, and will graduate with his degree in Psychology in December. Most recently, he's been in Cleveland working the basketball camp at Cleveland High School, both instructing kids with a voice and new-found maturity and mentoring them about major life decisions, such as choosing a school. "My advice at this point is to tell kids that college is the biggest step in life to make 'on your own.' A lot of people that have different interests in kids going to different places - why I don't know," he said. "At that end of the day, you have to be able to wake up in the morning and say you made the decision because you wanted to make it, and not because you liked a girl or some other reason. You have to put yourself in the best decision in life going forward, because only two percent of kids go on to play in the NBA for a year or two, and maybe 0.5 percent play for five years. What you have to do is evaluate the college and see what it has to offer and pursue a degree, because if you get that degree, although it might not be worth as much as a pro career, but the longevity of that career will be much better than any pro sport. You have to do some soul searching and decide what things you're really into and what things you enjoy doing. You then need to select 5-10 colleges and narrow it down from that. "It's a decision you need to make for yourself." Yarbrough admitted his decision to attend the University of Tennessee was based primarily in part due to his brother, Del Baker, who also played at Tennessee. It wasn't a decision he regrets. "My situation was different in that I had a family member that played there," he said. "My brother was the only person in my family that loved basketball. Me? I was horrible growing up. I was clumsy and all that. The thing was, my brother was there and I always followed him. If he went across town, I was with him. If he was going to somebody's house, I was with him. At the end of the day, the best thing was for me to go to Tennessee. I was 16 at the time, my mom was 45 minutes away; my brother was there; and my family was in the surrounding area. "My first few weeks, I was unsure of my decision, but I look back and with the career I had, the people I met and who mentored to me, I don't think I could have received a better education. Not just from the university, but the surrounding things that went along with it." Giving back to the Cleveland community has been something that the Chicago native has wanted to do before, but until a conversation with head basketball coach Jason McCowan, hasn't had the opportunity. "I was raised in the north side of Chicago, where the projects are possibly the worst in the world," he said. "Not many kids make it out of there. I moved to Cleveland because a woman was stabbed on my porch; out of four kids I grew up with, only two are still alive and that's me and my brother. I had a lot of talent in basketball, but I had a lot of help. It's not that I was better; it's that I was a good kid, and that goes a long way. I was 6-foot-7, but I was a good kid, too, and that goes further that being 6-7 and not a good kid." Now content with his career, family and choices, Yarbrough finds himself just trying to help others in a way that he was aided growing up. "This is nothing more than a little bit of time for me," he said of the camp. "I want to see a kid come to me in four years come tell me that they're successful, and even if they didn't learn a thing skill-wise, tell me I taught them how to act and be respectful because people are always watching -- not always just because they're a good basketball player, but sometimes just to see how big of an idiot you are. "I just want a kid to have the opportunity I had."